Ahmir 'Questlove' Thompson is many things: virtuoso drummer, producer, arranger, Late Night with Jimmy Fallon bandleader, DJ, composer, and tireless Tweeter. He is one of our most ubiquitous cultural tastemakers, and in this, his first book, he reveals his own formative experiences--from growing up in 1970s West Philly as the son of a 1950s doo-wop singer, to finding his own way through the music world and ultimately co-founding and rising up with the Roots, a.k.a., the last hip hop band on Earth. Mo' Meta Blues also has some (many) random (or not) musings about the state of hip hop, the state of music criticism, the state of statements, as well as a plethora of run-ins with celebrities, idols, and fellow artists, from Stevie Wonder to KISS to D'Angelo to Jay-Z to Dave Chappelle to...you ever seen Prince roller-skate?!? "MO' META BLUES isn't just a memoir. It's a dialogue about the nature of memory and the idea of a postmodern black man saddled with some postmodern blues. It's the side wind of a one-of-a-kind mind. It's a rare gift that gives as well as takes. It's a record that keeps going around and around. "[MO' META BLUES] is incredible . . . [Questlove is] one of the more unabashed music geeks to ever walk the earth . . . a student of music and pop culture. But, as the book demonstrates, Thompson is also a wonderful storyteller." --Pitchfork.com "After reading it, you'll feel like you know Questlove. The book is intimate and funny. Plus, you'll come away with a crash course in hip-hop history." --NPR.org "A hip hop thinker with historical perspective . . . an excellent book." --Philadelphia Inquirer "A thoughtful, incisive analysis of hip hop-and pop music in general-from one of its foremost contemporary architects . . . a book with as much warmth, heart, and humor as introspective intelligence. Fanatics and newcomers to the music will both find plenty of revelation here." --Kirkus Reviews (starred review) "Smart, funny, insightful . . . [The] joy of this book is getting to live inside Questlove's jam-packed, restless brain for a while . . . Four stars." --Rolling Stone "A busy thicket of musical geekery . . . likable . . . funny . . . MO' META BLUES has an open-mike, improv-night spirit . . . The end pages on my copy are crammed with song titles; they resemble the back of a popular girl's senior yearbook." --Dwight Garner, New York Times "I truly love this book. I felt like I was having a conversation with Ahmir, and I may have even said aloud a few times, "What? No way!" It's everything I want to know about someone who is obsessed with music...his love for music (contemporary/revolutionary/cool) is tireless. I am forever a fan of Questlove's fanaticism." --Fred Armisen "Questlove is an artistic giant and spiritual genius whose roots go back to Curtis Mayfield and so many others. This book is a gem to read and a joy to feel! Don't miss it!" --Dr. Cornel West "Attention White Girls: Stop reading about vampires and read what Questlove has to say instead. 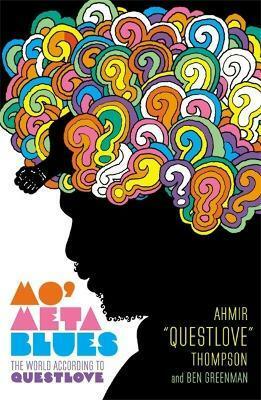 Mo' Meta Blues is a magical kaleidoscope about a high concept, low maintenance genius named Ahmir. Like him, it's smart, funny, sweet and in a thousand places at once. Read it or rot on your vine." Ben Greenman is an editor at the New Yorker and the author of several acclaimed books of fiction, including Superbad, Please Step Back, and What He's Poised to Do. As a journalist and critic, he has written widely on music and pop culture. His most recent novel is The Slippage. He lives in Brooklyn and has never been known to DJ, ever.